The sun’s setting on the last day of our Oregon vacation. I’m sitting on the back deck of the home of Bill Hanson with a fat glass of Libra Wines’ 2008 Momtazi Reserve. Bill, the owner and winemaker of Libra, looks out over the vineyard as sunset approaches and cracks a little smile. Our long, twisty road from the baggage claim at PDX to Bill Hanson’s back deck began at Oregon Wines on Broadway in downtown Portland. One of the wines in their pinot flight was the Libra 2009 Willamette Valley Reserve. We absolutely loved it. Rich, perfectly balanced, and flavorful without being too heavy. We asked the fun-loving folks at OWOB if Libra had a tasting room. They said no, but indicated that they thought he showed his wines at the Carlton Winemaker’s Studio. When our travels led us to that end of Willamette Valley, we discovered the aforementioned studio was a dead end. No Libra. They told us that he’d been working as the winemaker at Panther Creek and they sometimes poured Libra in the tasting room. We thanked them and moved on. At Panther Creek, we discovered that Bill and the higher-ups had had a parting of the ways. Thankfully, the Panther Creek pourer gave us Bill’s phone number. Which was disconnected. However, the pourer let Bill’s wife, Linda, know that we were trying to get in touch with them – and gave them our number, which we’d left at the tasting room. After a couple of phone tag calls, we were able to set up a tasting for the end of the last day we’d be there. We made our way out into the Yamhill countryside, following directions which included, “take a hard left onto the dirt road… I’ll try to remember to leave the gate open for you,” which, thankfully, he did. We exchanged a few pleasantries before discovering that Bill and the Sweet Partner in Crime were both born in Danville, Illinois. Run with it they have. 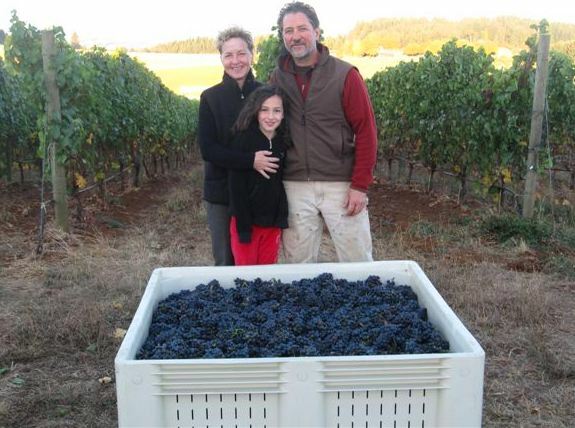 Bill started us with his Willamette Valley Pinot Gris, full of sunlight, citrus, and tropical fruit. We went from there to back-to-back tastings of his 2009 and 2010 Willamette Valley Reserve. These wines, a mixture of estate and Valley fruit, were completely different. The 2009 tasted fruitier, higher in alcohol, and (in Bill’s words), “a little slutty.” The 2010, thanks to cooler temperatures, had much more complexity. I thought it was an absolutely beautiful wine, even young. 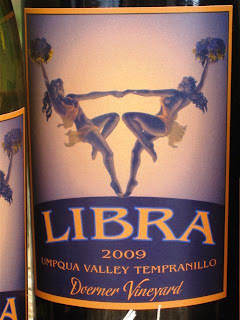 From there, we moved on to Libra’s Umpqua Valley Tempranillo, sourced from the , and finally to his Momtazi Vineyard Reserve. The tempranillo was good stuff, full of chocolate and tobacco flavors. The Momtazi was nothing short of a rock star – smoky, sultry, and special. The most expensive wine in the Libra catalog is the Momtazi. At $35, it absolutely blew away many of the wines we tried on the trip that retailed for twice as much. After that, we retasted a few things – but we weren’t paying a lot of attention by that point. We were soaking up the sun, good conversation, and good company. 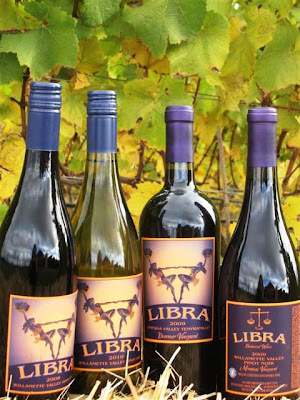 Libra’s a limited distribution wine, so it will likely be difficult to track down in local stores. The best way to find it is to order it straight from the source: http://www.librawines.com -- trust me, you’ll be glad you did. And if you happen to be in the Willamette Valley, give Libra a call. Bill will leave the gate open for you.